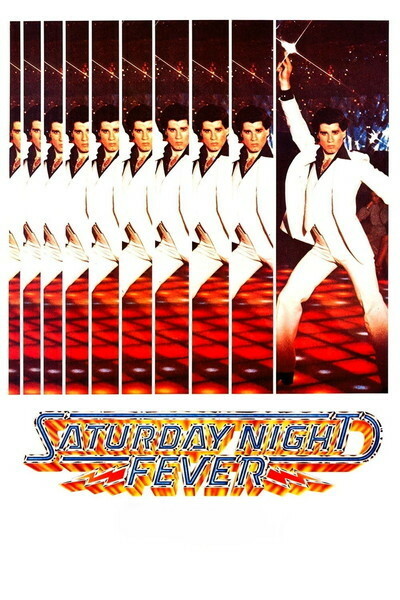 "Saturday Night Fever" is an especially hard-edged case and a very good movie. It's about a bunch of Brooklyn kids who aren't exactly delinquents but are fearsomely tough and cynical and raise a lot of hell on Saturday nights. They live for Saturday night, in fact: They hang their gold chains around their necks and put on the new shirts they bought with their Friday paychecks, and they head for a place called 2001 Odyssey, and they take pills and drink and, as Leo Sayer put it, dance the night away. Occasionally they go out to the parking lot for a session in the back seat with a girl. John Travolta is the center of the crowd: He's Tony Manero, the best dancer, the best looker, the guy with the most confidence. His life is just as screwed up as everyone else's, but they don't know that, and they tell him: "You know somethin', Tony? You always seem to be in control." He is not. He works all week at a paint and hardware store and comes home to a family that worships his older brother, who is a priest. The family's sketched briefly right at the beginning in a dinner scene which, like the whole movie, is able to walk the tightrope between what's funny and what's pathetic. We meet Tony's friends and the girls that hang around them, and we are reminded that feminism has not yet conquered Brooklyn. Some of the girls, especially a spunky little number named Annette (Donna Pescow), worship Tony. He dances with Annette because she's a good dancer, but he tries to keep her at arm's length otherwise. He's caught in a sexist vise: Because he likes her, he doesn't want to sleep with her, because then how could he respect her? The female world is divided, he explains, between nice girls and tramps. She accepts his reasoning and makes her choice. The Brooklyn we see in "Saturday Night Fever"reminds us a lot of New York's Little Italy as Martin Scorsese saw it in "Who's That Knocking at My Door?" and "Mean Streets." The characters are similar: They have few aims or ambitions and little hope of breaking out to the larger world of success -- a world symbolized for them by Manhattan, and the Brooklyn Bridge reaching out powerfully toward it. But "Saturday Night Fever" isn't as serious as the Scorsese films. It does, after all, have almost wall-to-wall music in it (mostly by the Bee Gees, but including even "Disco Duck"). And there are the funny scenes (like the one where Travolta shouts at his father: "You hit my hair!") to balance the tragic and self-destructive ones. There's also a hint of "Rocky," whose poster Travolta's character has on his bedroom wall. Travolta meets a Brooklyn girl (Karen Gorney) who's made it in Manhattan, sort of, as a secretary. She comes back to Brooklyn to dance, and they team up to enter a $500 disco contest. They win it, too, but not before winning has become meaningless to Travolta. Their relationship is interesting because Travolta sees Miss Gorney not so much as a girl (although he thinks she's beautiful) but as an example of how he might escape Brooklyn. The movie's musical and dancing sequences are dazzling. Travolta and Miss Gorney are great together, and Travolta does one solo (in an unbroken shot) that the audiences cheered for. The movie was directed by John Badham ("The Bingo Long Traveling All-Stars and Motor Kings"), and his camera occupies the dance floor so well that we really do understand the lure of the disco world, for all of the emptiness and cruelty the characters find there.